The flowers are the gift from the Italian town Sanremo, and the audience can take home them after the concert. 0:04:50 Johann Strauss II: Kuss-Walzer, English: ‘Kiss Waltz’, op. 400, a waltz composed in 1881. The waltz was dedicated to the Austrian composer’s second wife, Angelika Dittrich. The waltz comprises melodies from Strauss’ popular operetta Der lustige Krieg (The Merry War) and is an orchestral treatment of the Act 2 aria ‘Nur für Natur’ which was a hit when first performed. Eduard Strauss, the composer’s brother, first conducted the orchestral piece at the Court Ball in Vienna in 1882.The introduction consists of arresting chords in the key of G major before proceeding discreetly into a quiet yet poignant waltz theme. The Kiss Waltz differs from Strauss’ other waltzes in that the first theme recurs very often, and there are only three other waltz sections of which the first theme would be played again after concluding those successive sections. Despite being of such an economical structure, the waltz was well received at its first performance. 0:16:15 Johann Strauss II: Aus den Bergen (From the Mountains), opus 292. The work was first performed in Pavlovsk on October 2nd 1864, under the title In den Bergen. The composition was dedicated to the music critic Eduard Hanslick. Critics commented on Strauss’ waltz that “after a long time a new waltz from Johann Strauss has appeared, which is distinguished by noble and graceful character, and further distinguished by extraordinarily masterful instrumentation.” The first Viennese performance of the waltz was in the Volksgarten as part of a benefit concert commemorating Strauss’ twentieth anniversary of his debut as a composer. 0:29:30 Franz von Suppé: Leichte Kavallerie overture. It is an operetta in two acts by the Austrian composer Franz von Suppé ((18 April 1819 – 21 May 1895)), with a libretto by Karl Costa. 1:16:40 Richard Wagner: Prelude to act 3 of Lohengrin, WWV 75, a Romantic opera in three acts composed and written by Richard Wagner, first performed in 1850. The story of the eponymous character is taken from medieval German romance, notably the Parzival of Wolfram von Eschenbach and its sequel, Lohengrin, written by a different author, itself inspired by the epic of Garin le Loherain. It is part of the Knight of the Swan tradition. 1:50:45 Giuseppe Verdi: Prestissimo from the Ballet Music in Act III of the Opera “Don Carlo”, a five-act grand opera composed by Giuseppe Verdi to a French-language libretto by Joseph Méry and Camille du Locle, based on the dramatic play Don Carlos, Infant von Spanien (Don Carlos, Infante of Spain) by Friedrich Schiller. In addition, it has been noted by David Kimball that the Fontainebleau scene and auto da fé “were the most substantial of several incidents borrowed from a contemporary play on Philip II by Eugène Cormon”. The opera’s story is based on conflicts in the life of Carlos, Prince of Asturias (1545–1568), after his betrothed Elisabeth of Valois was married instead to his father Philip II of Spain as part of the peace treaty ending the Italian War of 1551–1559 between the Houses of Habsburg and Valois. It was commissioned and produced by the Théâtre Impérial de l’Opéra (Paris Opera) and given its premiere at the Salle Le Peletier on 11 March 1867. 1:54:15 Johann Strauss II: Wo die Zitronen blühen (Where the Lemons Blossom or, Where the Citrons Bloom), op. 364, a waltz by Johann Strauss II written in 1874. The waltz was composed during a tour of the composer in Italy where he travelled with the Langenbach Orchestra of Germany and performed the work at the Teatro Regio in Turin on 9 May 1874. The waltz came after a successful premiere of his famous operetta Die Fledermaus and Strauss originally entitled the waltz as ‘Bella Italia’ (Beautiful Italy) for his Italian audiences before renaming it ‘Wo die Zitronen blühen’ after a quote from Johann Wolfgang von Goethe’s novel Wilhelm Meisters Lehrjahre — ‘Kennst du das Land wo die Zitronen blühen?’ (‘Do you know the land where the lemons blossom?’). 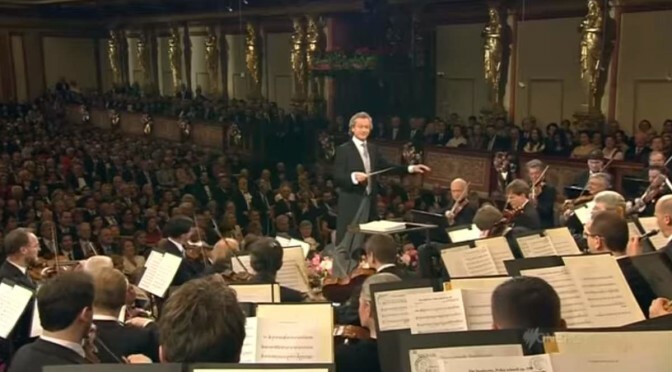 2:28:30 Johann Strauss: Radetzky March, Op. 228, a march composed in 1848. It was dedicated to the Field Marshal Joseph Radetzky von Radetz and soon became quite popular among regimented marching soldiers. It has been remarked that its tone is more celebratory than martial; Strauss was commissioned to write the piece to commemorate Radetzky’s victory at the Battle of Custoza.